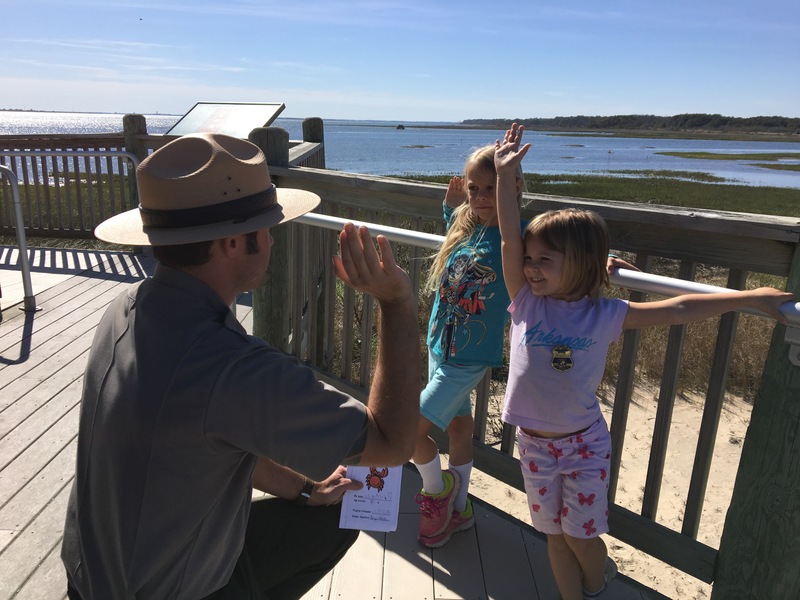 In preparation for visiting Chincoteague Island, I read Misty of Chincoteague to the girls. And I’m glad we read it, because the Misty book series is definitely the island’s claim to fame. If you are a Misty fan, there are references from the book all over town – our campground was called Tom’s Cove, and it was on Beebe Road, and the main thoroughfare through town was Maddox Boulevard. The author Margeritte Henry did an excellent job of incorporating lots of real people and places into her works. And even though books were set in the 40’s, many parts of the small town and seashore seemed straight out of the tales. Beach houses bleached by sun & sand had signs in their front yards: “Books” or “Tea Room” or “Crabs”. One afternoon I bought some fresh fish from Ricky’s Seafood & Produce which was part of the guy’s garage, with all sorts of other treasures for sale like small carved wooden mermaids, seashell jewelry, and various tools for cracking delicious sea creatures. 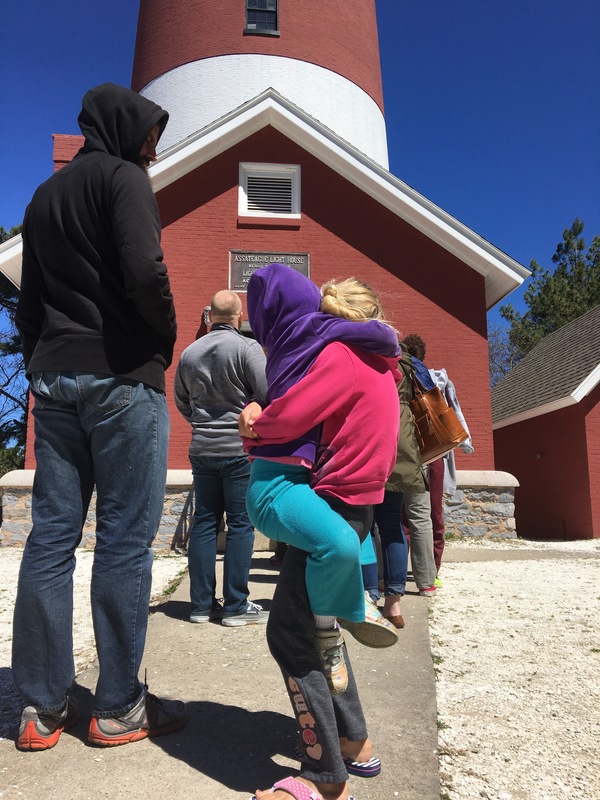 There were antique stores and art galleries, Bay Treasure stores and Lighthouse Inns, and several different Crab Shacks. There were lots of bicycles and scooters for rent and boat docks everywhere. Cars drove slowly and often had to stop to wait for ducks to cross the road. The one time I walked down a sidewalk, 2 cars passed me and both stopped to talk. Fishing Pier/Pony View Deck at Tom’s Cove Campground. 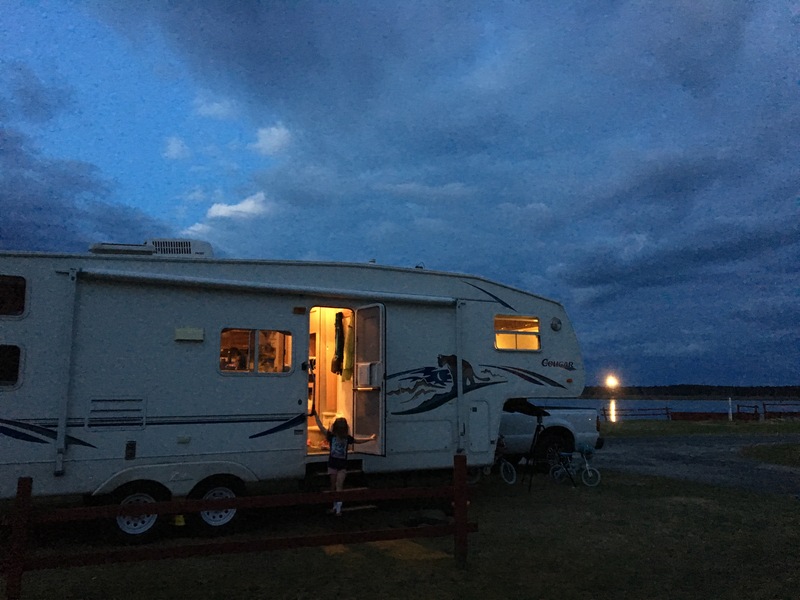 Our campsite at Tom’s Cove with the Assateague Lighthouse in the distance. Each time we left our campground we drove right past the fairgrounds where the annual Pony Penning Day is held, with signs for the July 2017 event hanging at the entrance. We heard that they expect around 50,000 people to attend the events each summer. 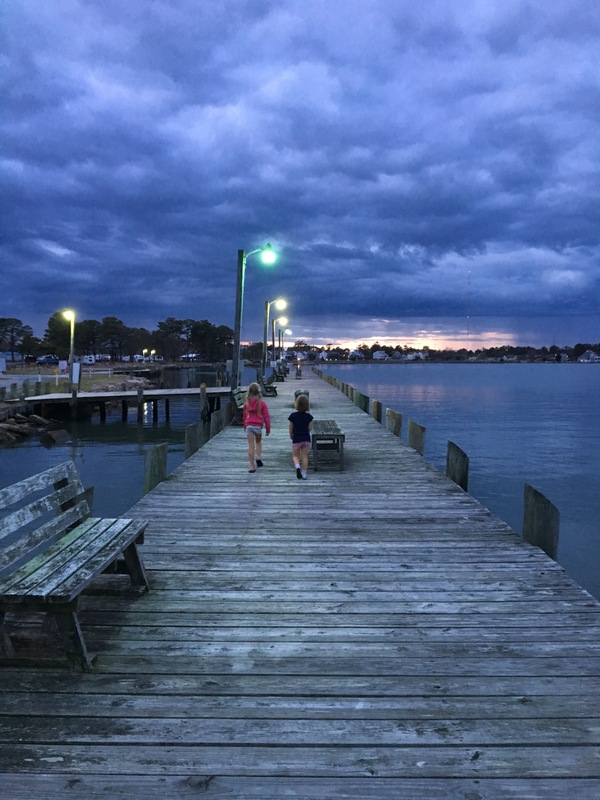 If you aren’t familiar with the Misty story – Chincoteague Island is a small island in Virginia. 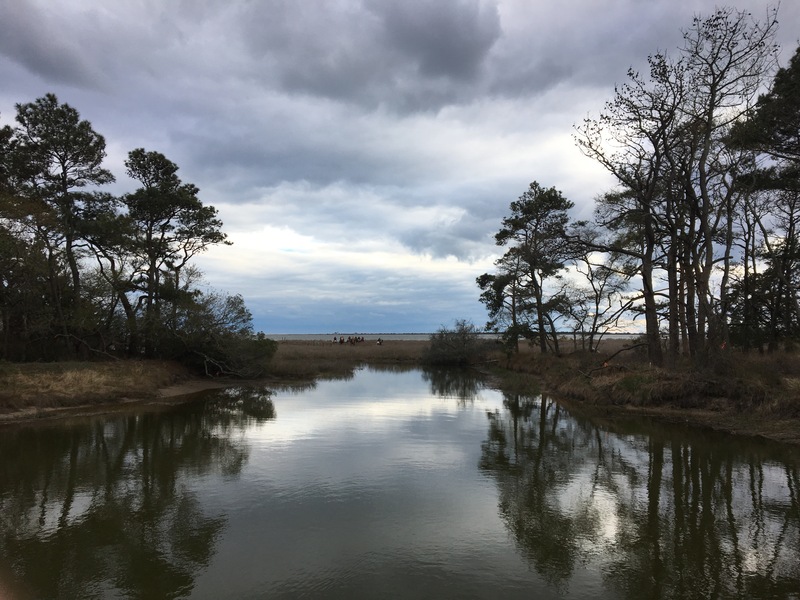 A long skinny barrier island called Assateague lies to the east of it, protecting Chincoteague from the harsh conditions along the edge of the Atlantic Ocean. The northern end of Assateague is in Maryland, and the southern half is in Virginia. 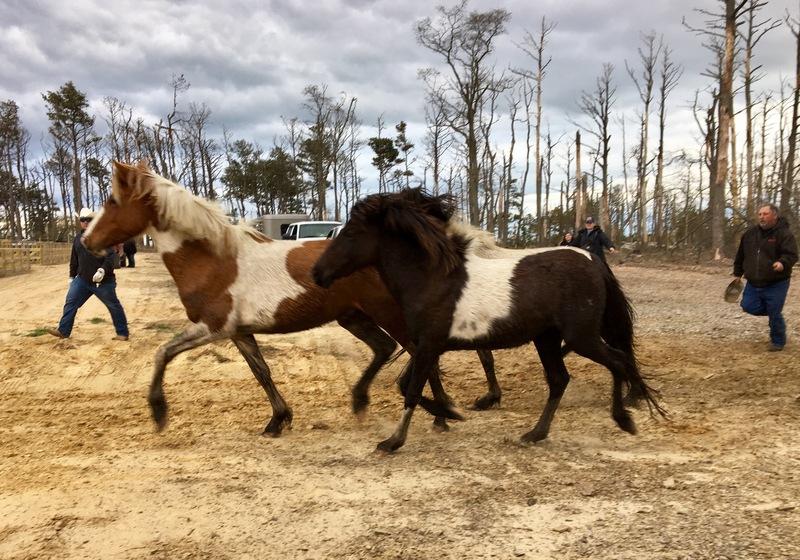 Legend has it that a Spanish galleon transporting horses was shipwrecked off the coast of Assateague in the 1600’s and their decedents are now the wild horses of Assateague. Other theories are a little less glamorous – that farmers used the island as a natural corral for their horses in the 1800’s because they could avoid paying taxes on the animals if they weren’t on the mainland, so the wild herds are decedents of escapees or animals left behind over the years. Grazing ponies at Assateague National Seashore. 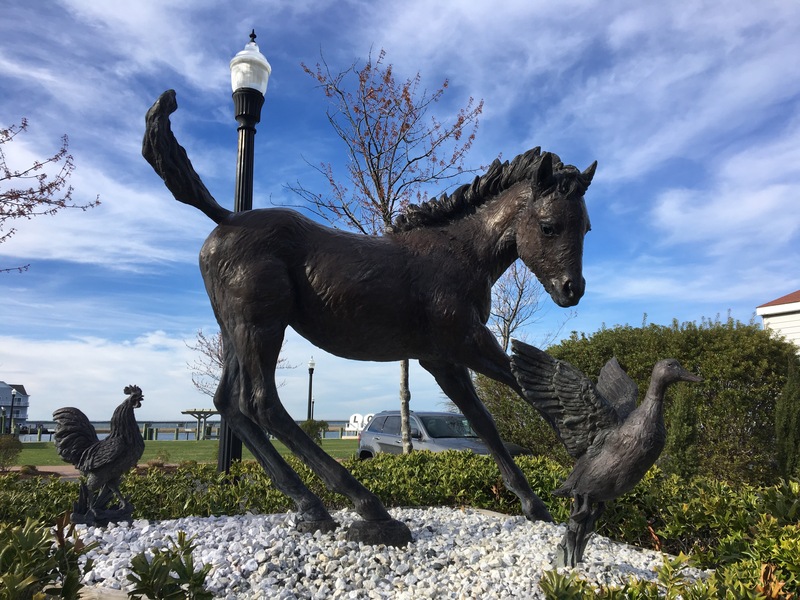 The Virginia herds of wild horses are owned by the volunteer Chincoteague Fire Department, and each July they herd them up and swim them across the water from the National Park & National Wildflife refuge over to Chincoteague Island, where they swim ashore at Memorial Park. Once paraded downtown to the fairgrounds, the yearlings are auctioned off as a fundraiser for the fire department. (This is how the kids in the Misty stories end up purchasing Misty & her mother.) Sometimes as we drove by we could see young ponies wandering around the fairgrounds – colts that were too young to be sold at last year’s auction. 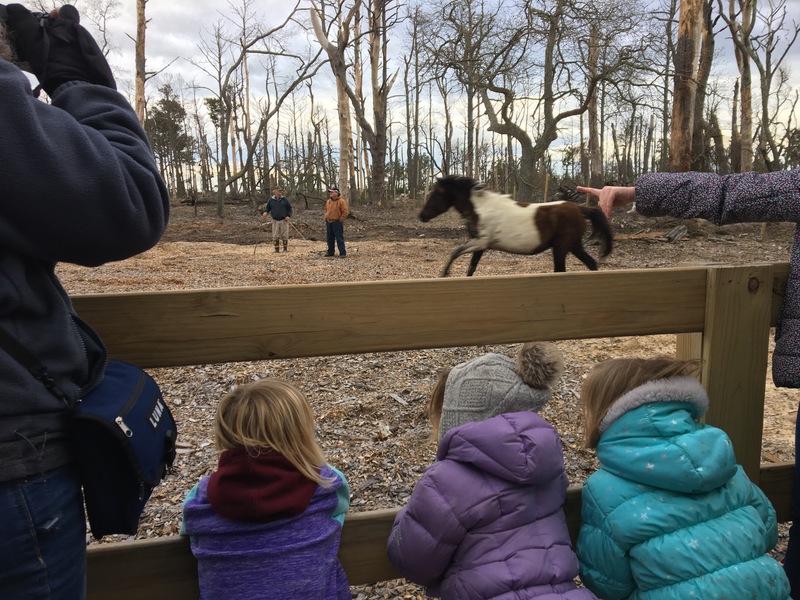 We just happened to visit Assateague on one of the 2 weekends a year that they corral the wild ponies for vaccinations and health checks! We joined a small crowd of people near the corral to wait for the firemen to herd them up. We waited in anticipation for over an hour, so we made a few new friends in the meantime! 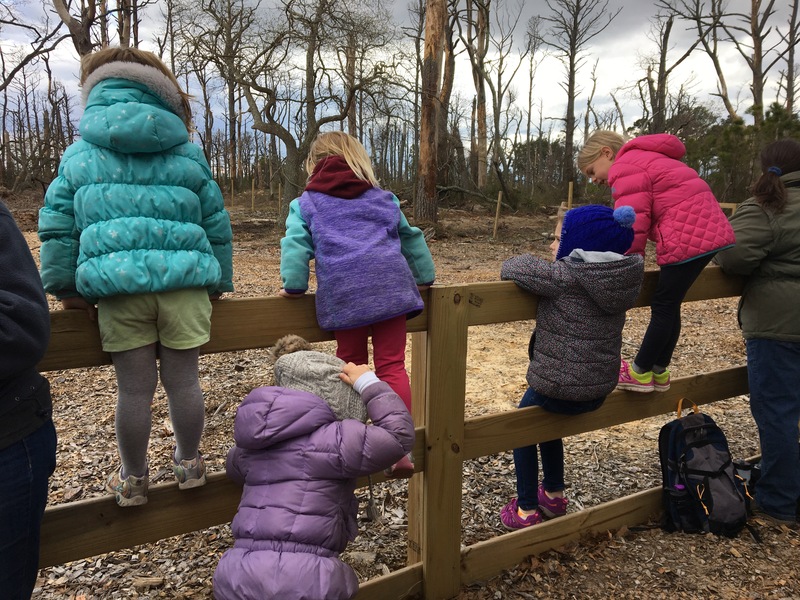 Watching them herd up the wild horses with our new friends from Virginia and Connecticut. It was such a special treat to get to see all the ponies up close! Just like the Pied Piper in the books, the warring stallions manage the social structure of the island. This stallion, Rip Tide, was causing quite a fuss in the corral when he met some of the younger stallions inside. 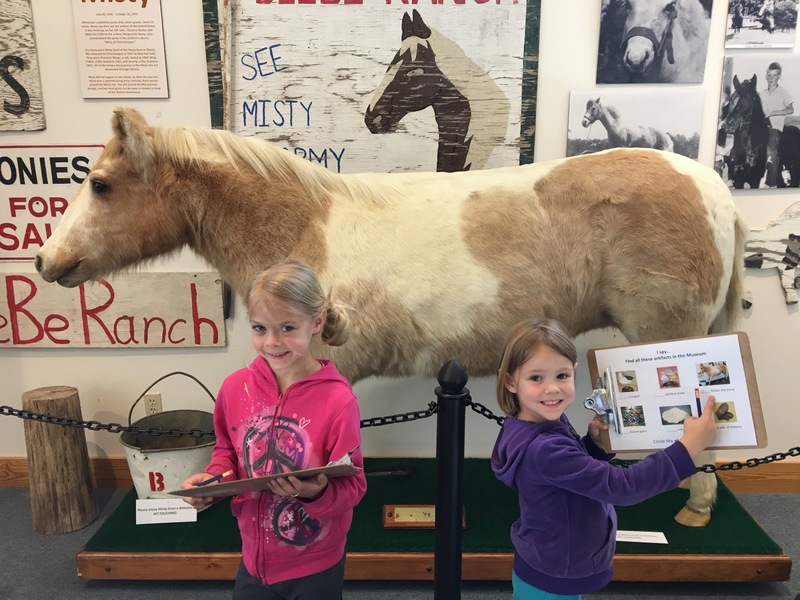 Even though I knew the town and the Pony Penning Day activities were real as we read the Misty book, I thought all of the people and animals were fictional. But it turns out the Beebe Ranch is a real place, and although Misty was actually born in captivity there, she was indeed a real horse. In fact, you can see the actual Misty who has been preserved through taxidermy at the Chincoteague Museum. Her hoof prints are all over this town – figuratively & literally. Many features in the town are either prominently or subtly horse related, if not in product then in name or decor. 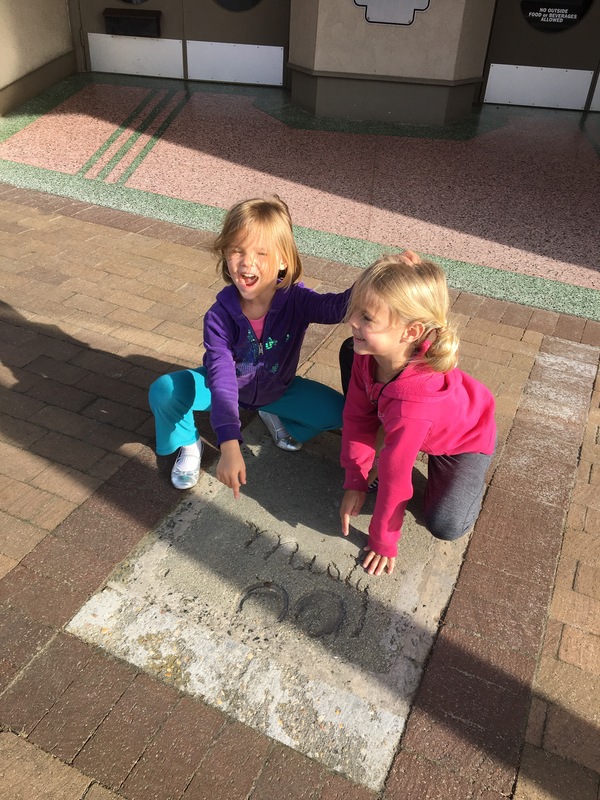 There is a sculpture a young Misty in downtown, and her actual hoofprints are in the cement outside the downtown Island Theater where the Misty movie premiered in the 1961. Here’s MISTY! 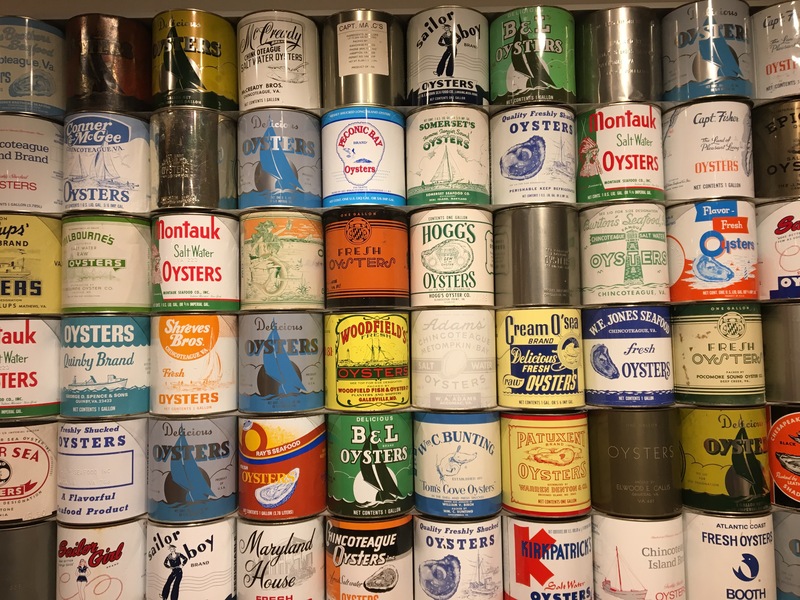 Preserved forever in the Chincoteague Island Museum. And that isn’t even the least bit weird. ….Right? 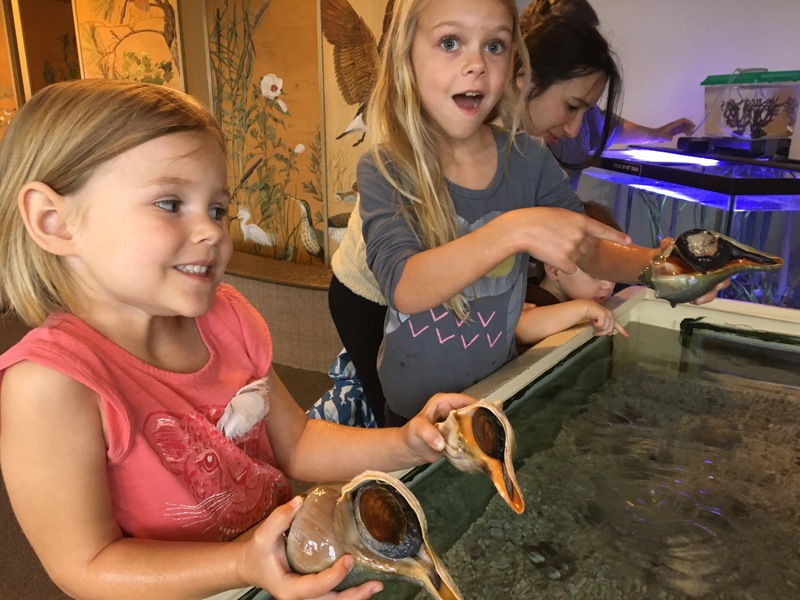 Learning a little bit about local history at the Chincoteague Museum. When the Misty movie premiered in NYC, there was also a premier in Chincoteague on the same night. Misty herself was in attendance, and they put her hoof prints in the cement outside the theater. 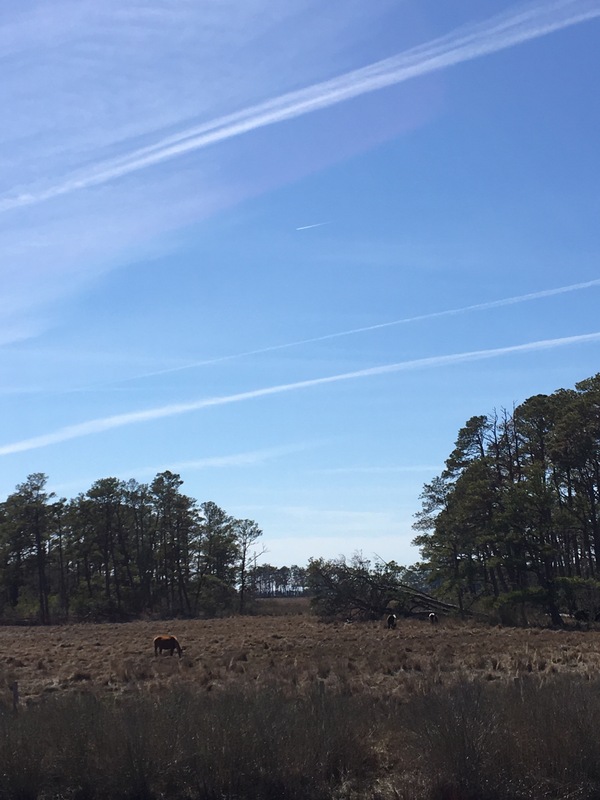 To be totally honest though, I have to say that the horses of Assateague seemed less and less wild the more we learned about the herds of Virginia. They are caught by people 3 times a year – once in July for Pony Penning Day and two other times for vaccinations & health checks. 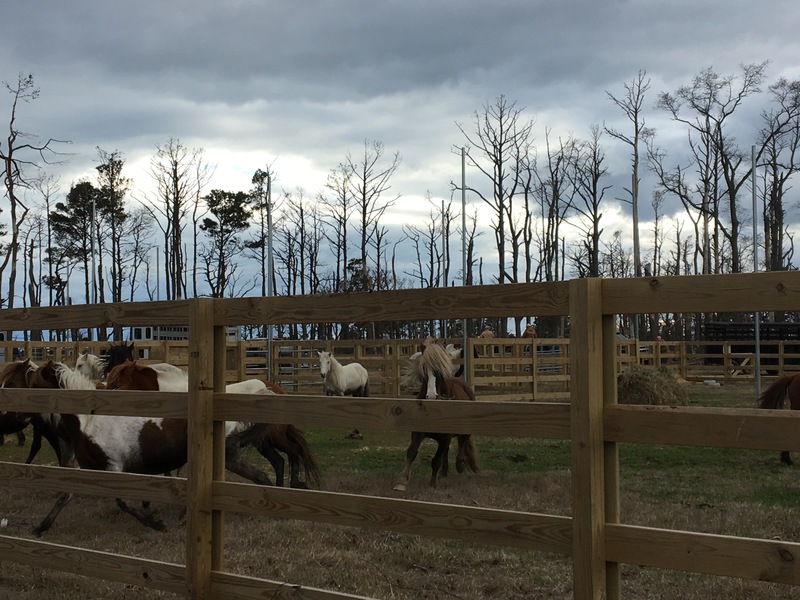 They actually aren’t free roaming on the island – they are in expansive fenced enclosures where the firemen have a grazing permit for 150 horses. And once they are caught at their first Pony Penning, they brand them with the year they were born, so most ponies have a brand on their flank. Maybe it’s just me, but seeing “wild ponies” with a numerical brand stole just a tiny bit of the magic. The northern herds in Maryland are managed differently, but they are still managed. They are all vaccinated – against pregnancy. To keep the herd numbers at a sustainable level for the narrow island, they shoot them with a vaccination dart after they’ve had their first foal so that they won’t ever have any more. 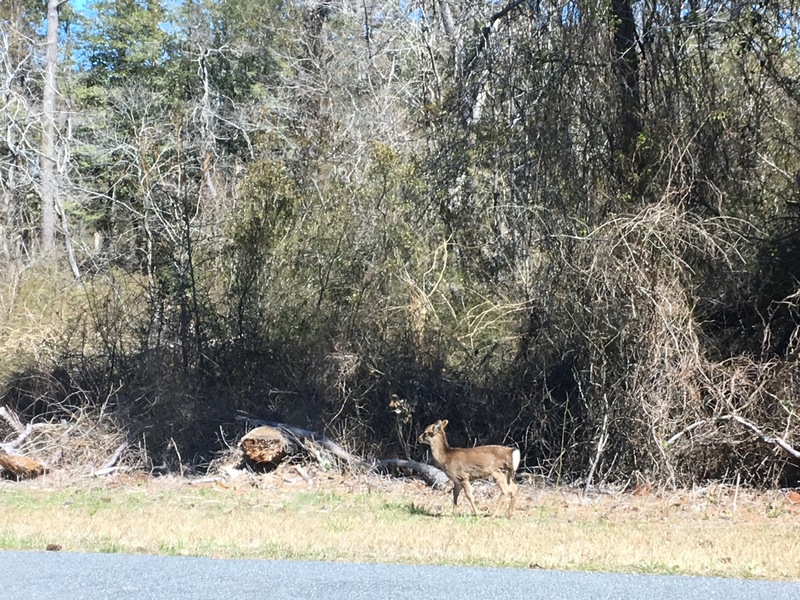 The Maryland herds boast much larger numbers, but they are so used to being around tourists at the seashore and State Park campgrounds that they just nonchalantly walk through traffic and crowds to nibble at trash or at people’s pockets. 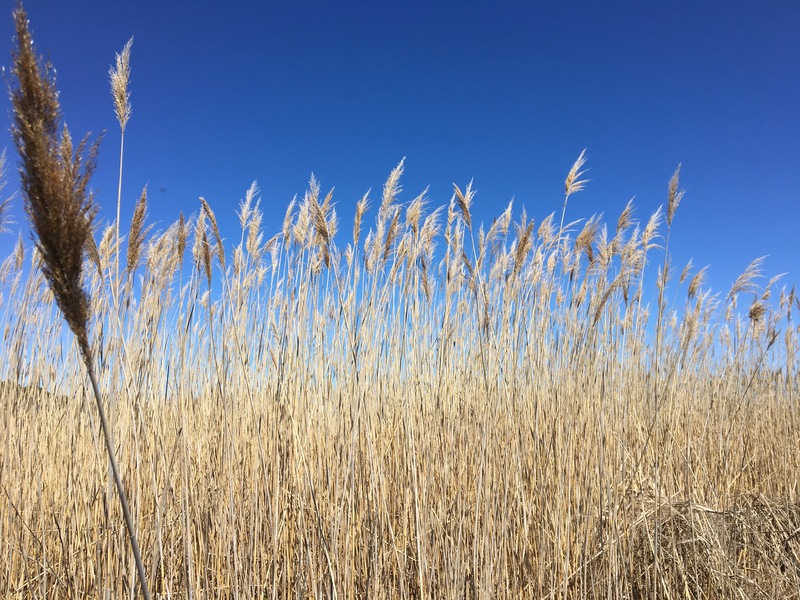 Marsh grasses at Chincoteague National Wildlife Refuge. 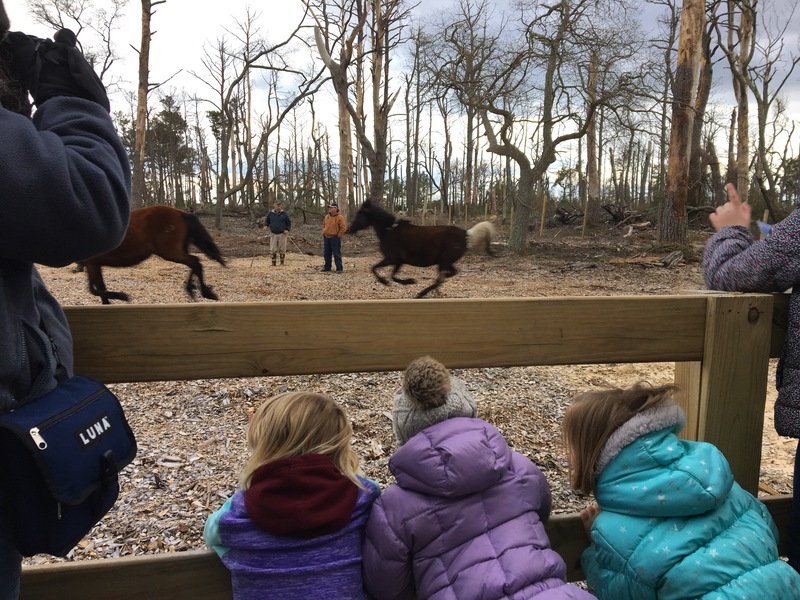 Despite these wild horses having some domesticated details, being on Chincoteague Island felt magical and fun, like we had actually walked into the storybook. 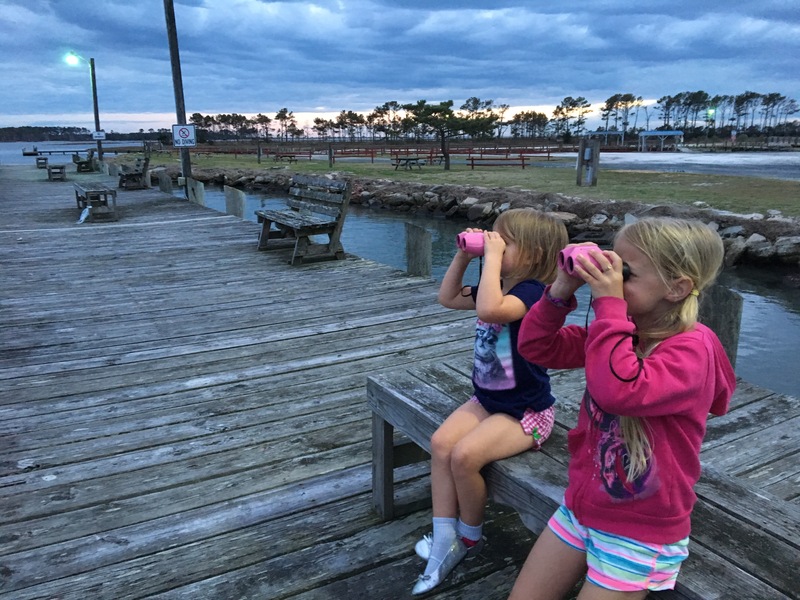 From the dock at our campground we could peek through binoculars to get just a peek of the far off ponies grazing on Pony Marsh. 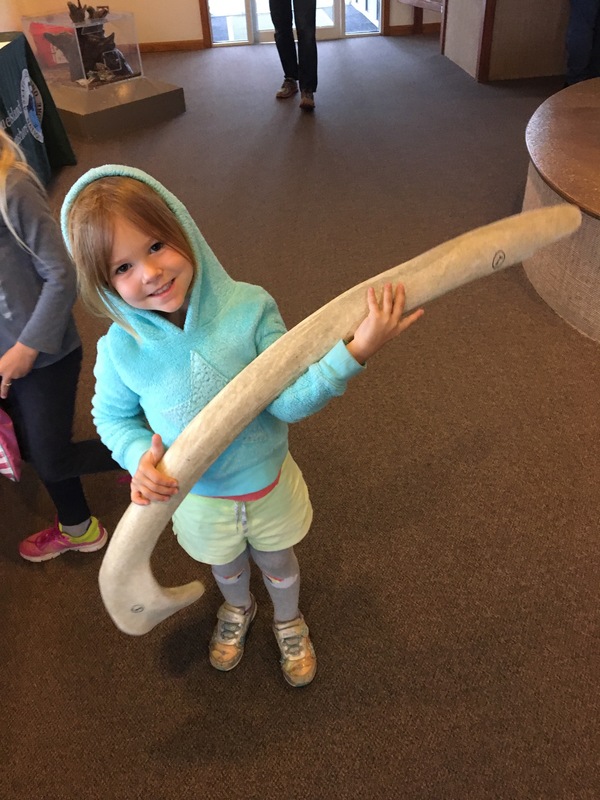 Throw in a couple more Junior Ranger badges, another great new friend, and beautiful glimpses of another part of America before the tourism season and I’d call that another amazing chapter in our story. 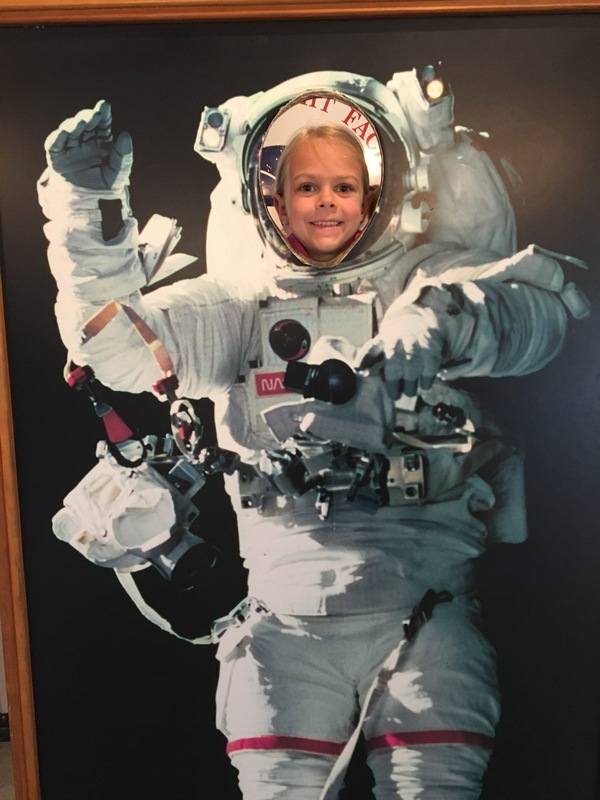 We hadn’t realized ahead of time that there was a NASA facility on neighboring Wallops Island, but once we learned of it we made to sure to make the free Visitor’s Center a destination one morning. 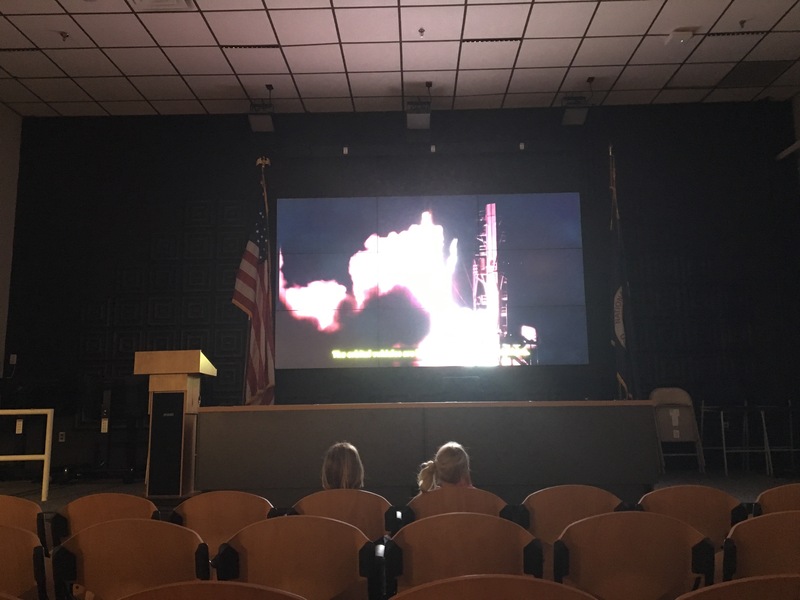 Learning about shuttle launches at the nearby Wallops Island NASA facility. 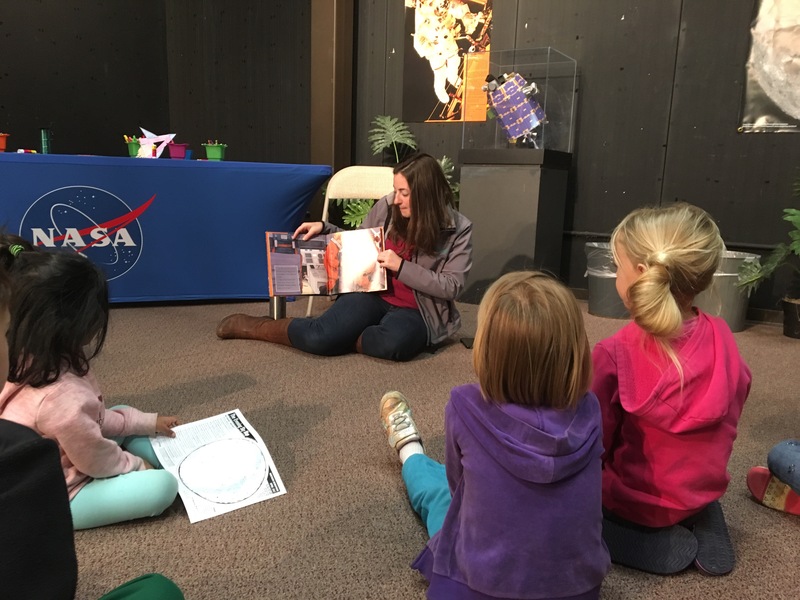 Story and craft hour at NASA, reading a book by astronaut Mark Kelly. 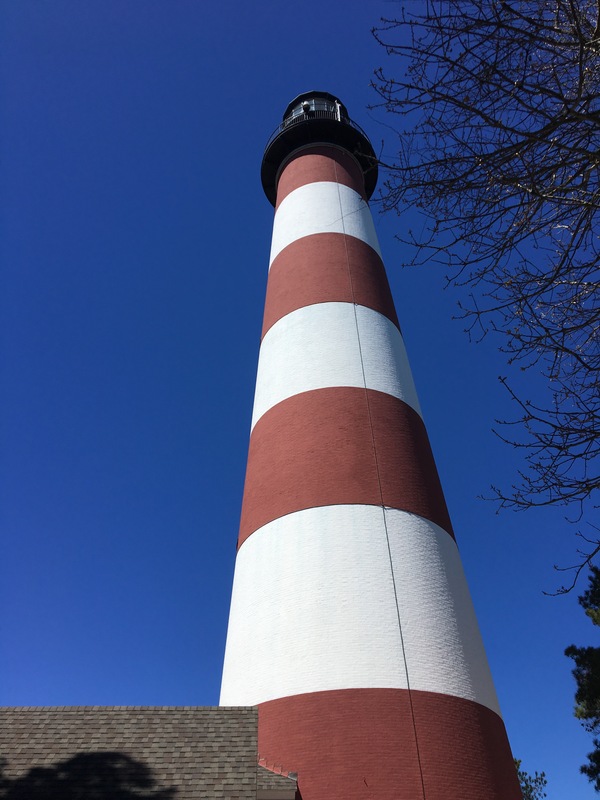 Assateague Lighthouse. Coral thought it was Cat in the Hat themed. 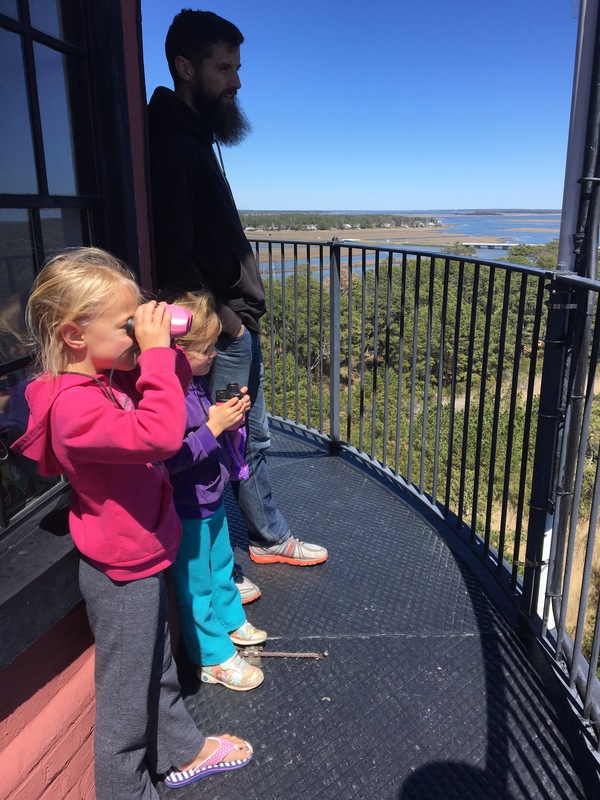 Checking out the views from the top – in the one small space that didn’t have serious wind. 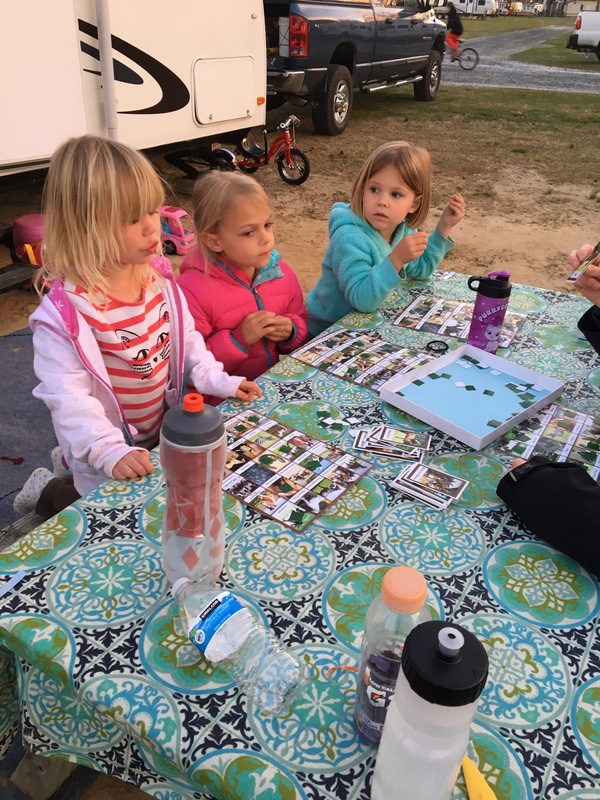 Horse bingo with our new campground friends. 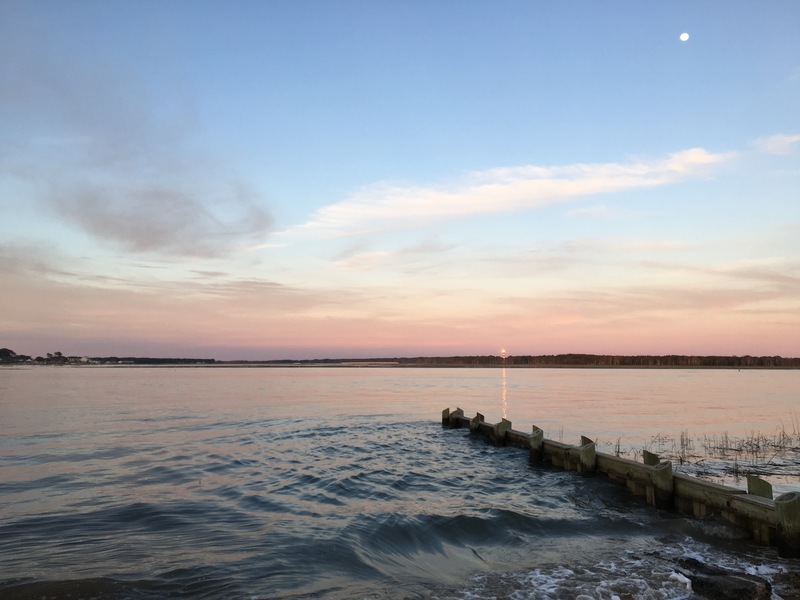 Dusk from our campground, looking at Assateague Lighthouse. 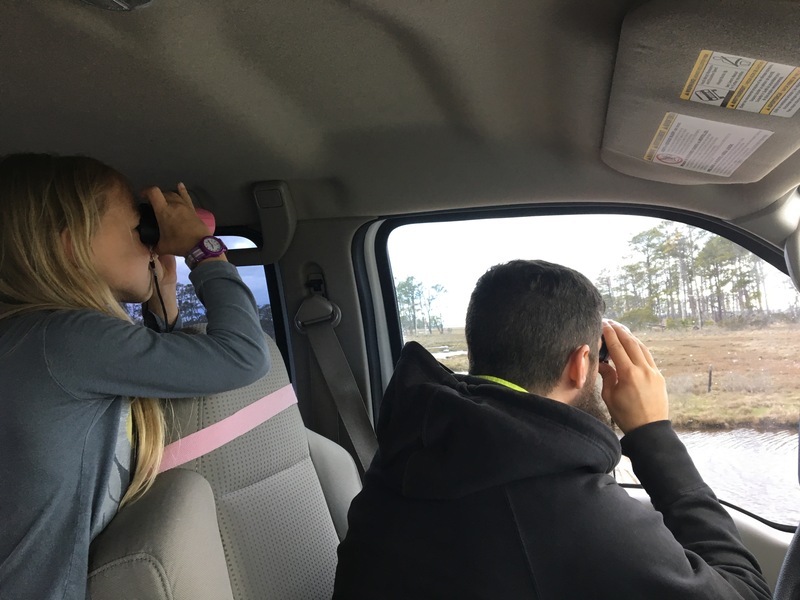 As we drove away from Chinocoteague to our next destination, we spent about an hour driving through Delaware. We didn’t stop anywhere, and I didn’t even end up taking a photo – so this was really our first drive-through only stop. I wish we could have stopped to make a special memory of the place, but we were towing, we were mostly driving past farmland, and we had a long trek ahead of us so we didn’t stop. The part of Delaware we saw was beautiful coastal farms. But it’s officially the only state that we haven’t stopped as we’ve passed so far. That still counts, right? 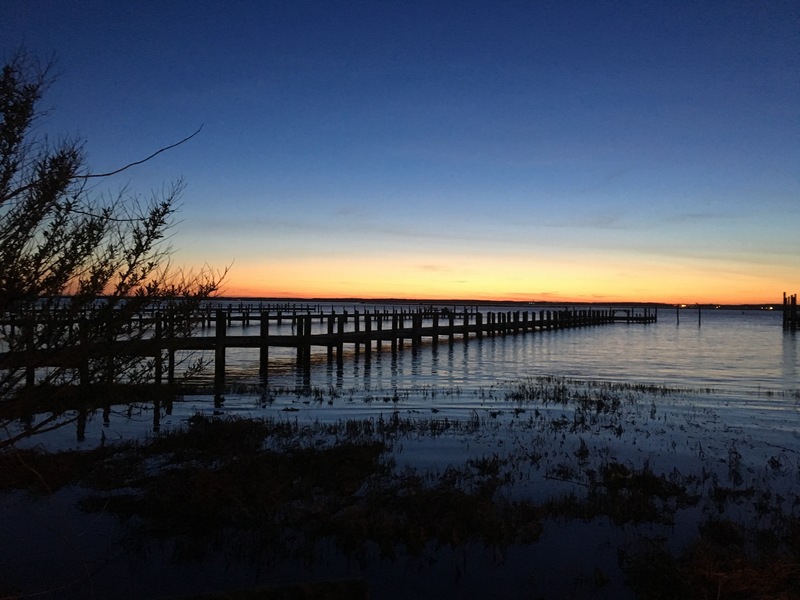 Sunset over the channel between Chincoteague and the mainland. Sunny and Coral, it had been 40 years since I read the Misty books. 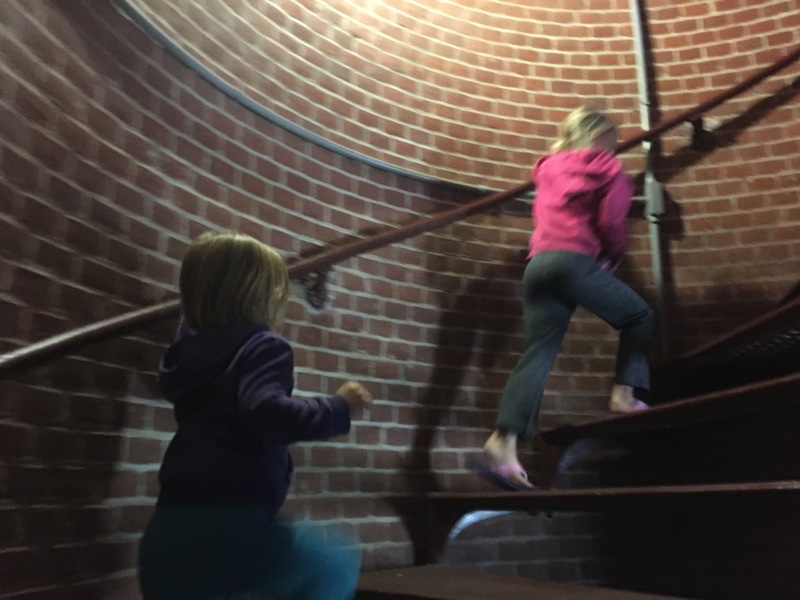 I got a couple at the library because I was inspired by your trip, and they are just as delightful now as they were when I was young! I encourage you to read the entire series. I’m so glad you got to visit there.